The Segway has existed for over a decade and enjoyed a gradual rise to fame, having appeared in all manner of movies and TV shows. And now that the police use them to patrol the streets and Segway city tours are common place around the world, the Segway and its Kamen’s balancing technology is rapidly rising in everyday use from electronic mobility aid to off-roading and rapid response security. Perhaps it’s the $3,000 price tag that’s holding the Segway back? But when compared to other light motor vehicles like quad bikes and mobility scooters, this seems the norm. Maybe it’s the unusual nature of its design, control and the advanced science that maintains balance that provides the barrier to entry? Or perhaps it’s simply because most people have never had the chance to actually ride one? Direction and speed is controlled by leaning and turning your body. The further you lean forward, the faster it goes. Lean back and it reverses. Shift your bodyweight (while holding on to the handle bars) and the Segway turns slowly on the spot or steers. But what’s actually happening is that various gyroscopic and fluid based levelling sensors attached to two computers within the Segway quickly analyse your weight and height while stationary and then use these sensors to detect the shift in weight and respond accordingly by changing speed and direction. Meanwhile the electric motors and can go up to 20 kmph, slightly faster than the average person’s sprinting speed. 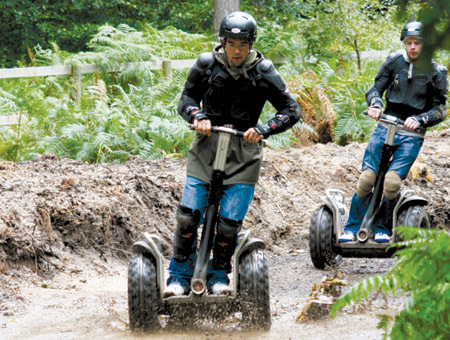 While Segway speeds are usually limited, the ones used for off road rallies aren’t. So body armour and BMX crash helmets are essential for riding safely at speed. Physically, riding a Segway at slow speeds is surprisingly comfortable, because you only need to stand straight and lean forward gently. Riding at speed uses more energy due to the shift in weight required to steer the Segway at speed while maintaining balance – even though the Segway does this for you using its many gyroscopes and sensors. However, whether travelling at speed or at a gradual pace, the Segway feels amazingly smooth on flat tarmac and pavements to sloping woodland tracks. And it’s all because of the gyroscope that maintains balance and control. Would I personally consider buying one over a quad bike or BMX? Definitely when the ride is so comfortable and it’s electrically powered, rather than petrol powered. However, the legal restrictions make Segway ownership problematic. Here in the UK the Segway is classified as a powered vehicle and subject to Road Traffic law. However, because it doesn’t meet the required safety standards, it is illegal on both roads and footpaths. This is because riders are too exposed to mix with general traffic on a road, while being too fast, heavy and dangerous to other users on footpaths or cycle paths. So the only place you can ride a Segway is on private property. And the same law applies in many other countries. Although there seem to be some exceptions where police are allowed to ride them, while tourists are allowed to hire them or ride them for city tours within certain designated areas. The Rise of the Segway? While the Segway has gradually grown in popularity over the years, its use remains restricted, although this hasn’t stopped Segway off road racing, Segway city tours and the Segway becoming a mode of mobilisation for security and police around the world. The growing popularity of the Segway seems to help various governments lift bans or restrictions on where it can be ridden. And with every ban that’s lifted, its popularity and general use becomes increasingly widespread. Perhaps it won’t be long until we’re all riding one to work after all?